The Mars rover Curiosity, also known as the Mars Science Laboratory, was launched on November 26, 2011, and successfully landed on Gale Crater of the Red Planet on August 6, 2012. I was almost forgetting but participated in NASA's program of "Send Your Name to Mars." The image above shows the certificate of this participation issued on June 4, 2010 by NASA. On NASA's page of this program, it is written that our names were being prepared for etching on a microchip for the Curiosity rover to carry it on its "back" (its "deck"). 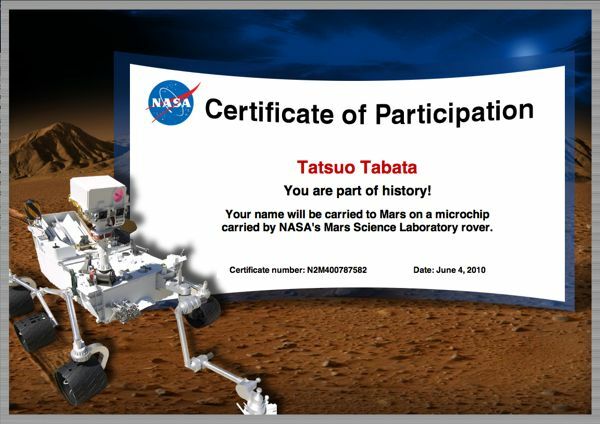 So, my name must also have landed on Mars on August 6, 2012. The Web site of Jet Propulsion Laboratory, NASA, includes the "World Participation Map" page of the above program. On this page, we find that the number of worldwide names sent is 1246445. Countries that have the largest number of participants are as follows: United States 529386 (42.5%), United Kingdom 77329 (6.2%) and India 59041 (4.7%). Japan comes at the 46th with the number 2865 (0.002%).